The one thing I wished I'd done differently with our purchase of a quarter of a pastured cow was to ask for more stew beef. I should have realized that most Americans would vastly prefer ground meat to stew meat, so nearly all of the tougher cuts showed up in our freezer ground. But ground meat doesn't make a very good fit for adding protein to soup...unless you turn it into meat balls! If you're using a food processor, just throw a chunk of parmesan, the basil, and the garlic in and whir the ingredients around until they're cut into tiny pieces. 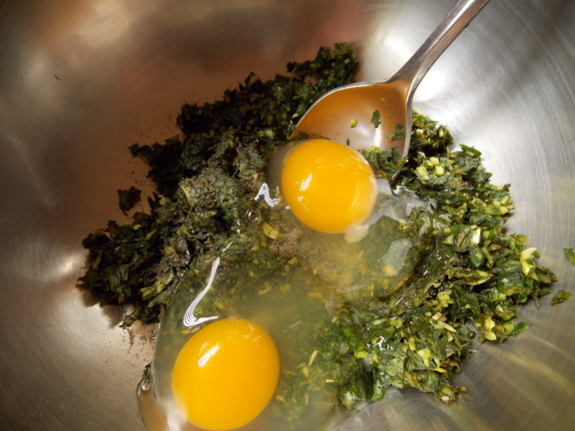 Otherwise, start by cutting up the basil, mincing the garlic, and grating the parmesan. Either way, you next add the egg (I was making a double recipe in the photo above, thus the two pullet eggs instead of one) and the salt and pepper. Wash your hands well, then turn the meat into the bowl with the seasonings and work them together until they're well mixed. Roll out the meat mixture into small balls and set them on a plate in the fridge for half an hour for the flavors to meld. Then heat a little bit of oil in a skillet over medium high heat and place the meatballs in the pan. 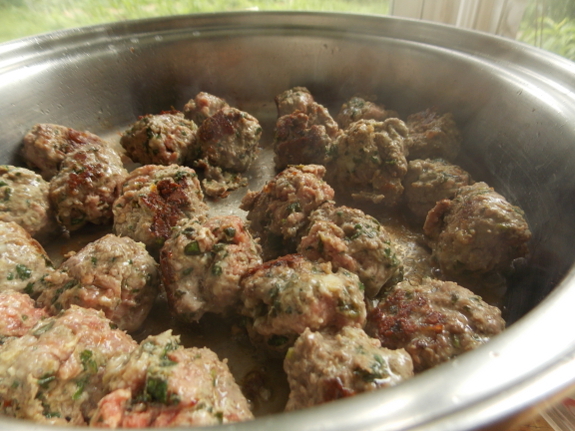 Once the bottoms begin to brown, turn the meatballs over and cook until the other side is brown as well. (The meat in the center of the balls will still be uncooked at this point.) Finally, make sure your pot of soup is at a gentle simmer and plop in the meatballs to finish cooking in the soup broth, a process that takes about ten more minutes. Cut a meatball open to make sure the centers are brown before serving. 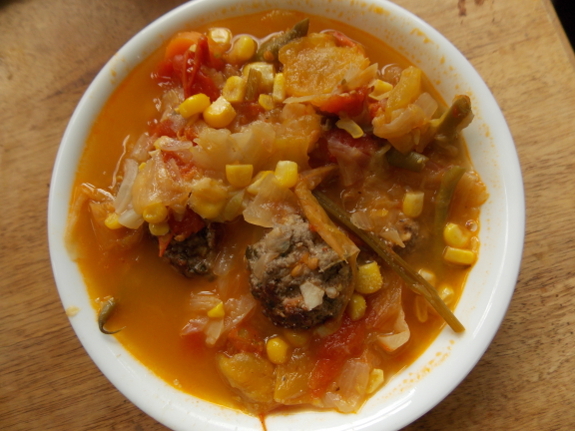 This recipe makes enough meatballs to add protein and oomph to 1.5 gallons of hearty soup if you're an average American. Before I met Mark, I probably would have made the meatballs smaller and used this recipe for 3 gallons of soup; and before Mark met me, he probably would have doubled this recipe to use in 1.5 gallons of soup, so use your own judgment. No matter which proportion you use, these meatballs will spice up your soup and turn it into a full meal! Your soup sounds delicious, by I disagree strongly about plain hamburger soup. I love soup. Basic veggie-beef starts with browned hamburger, followed by a mirepoix of onion, celery and garlic. Then tomato. And then, usually green beans and carrots (any hard veggie that won't cook to mush). leftover beans and some pasta finish it off. Any way: Love your daily posts. Keep up the good work. Stew meat is great...for winter. It requires long, slow cooking before it is succulent. Great for winter stew, not so great in a hot summer kitchen, unless you've canned it and can just pop the already cooked meat in a summer soup. Most of our ground beef goes to breakfast sausage, gives us a good long protein boost to begin the day. Yummy!